there is a bit of excitement and suspense for those of us who participate in the tuesdays with dorie/baking with julia challenges. each month, we nominate possible recipes from the book and then we wait to see what our challenges will be. 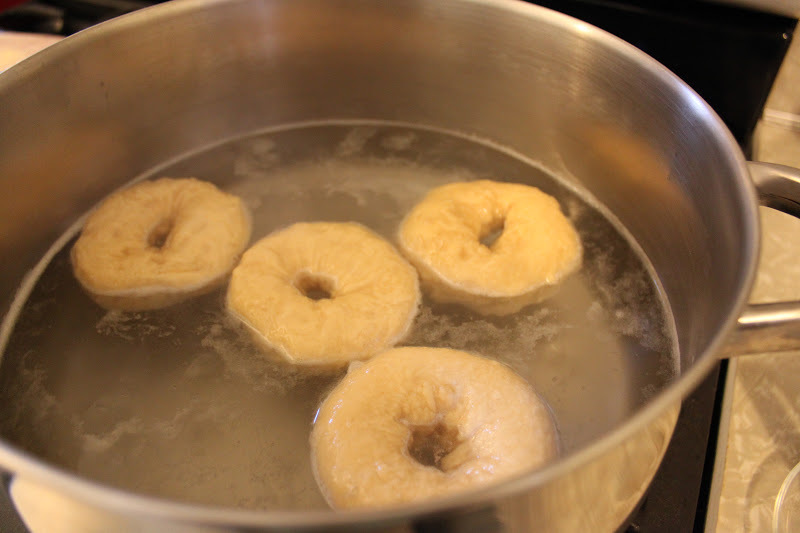 for me, this weeks challenge of bagels, hosted by heather of heather’s bytes was one i looked forward to. as a jersey girl(originally), i have a certain fondness for true new york bagels. then i read the recipe…so many steps, so much to coordinate, so many factors to alter the outcome of said bagels. to say that the recipe was a little daunting is an understatement. mix the dough, let it rise, deflate it, refrigerate it for a few hours or a couple of days and then move on to the shaping/baking process. all the steps to coordinate along with floured towels and extra pans and boiling water and an oven at 500 degrees while shaping the dough and boiling the dough and glazing the dough…definitely not a recipe for an impatient or inattentive baker-there are too many things to do. first thing i did, cut the recipe in half. with just two of us in the house, i didn’t need much less want 10 large bagels. for the sugar called for in the dough, i simply used malt syrup. then i added a generous tablespoon of dried onions. 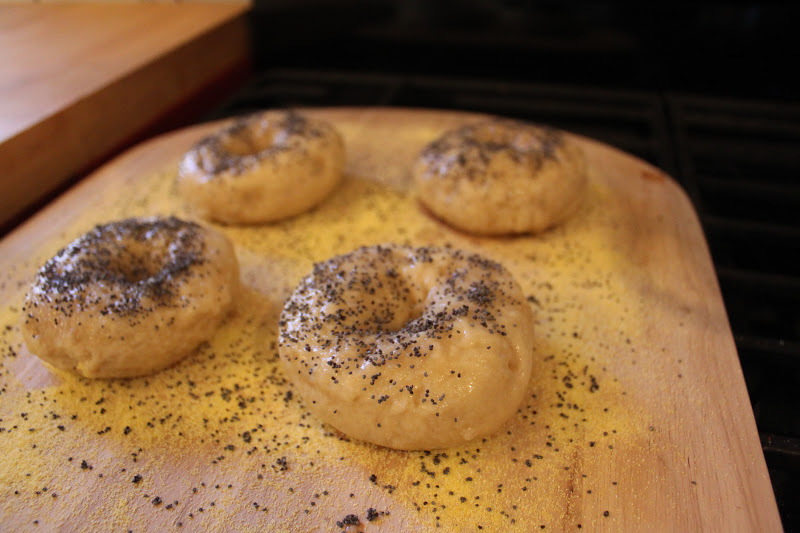 since my favorite bagels are ones with seeds, i chose to add poppy seeds to the outside since they blend so well with onions. the dough is easy to mix and next time(if there is a next time-the jury is still out on this one), i will add two tablespoons of the onions and a little extra salt. 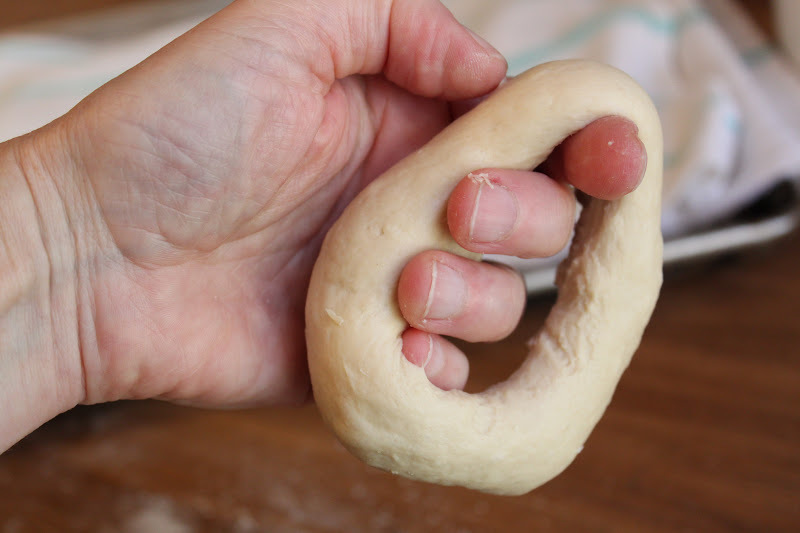 i used my scale to weigh out 8 (3)ounce pieces of dough and began the shaping process. it was a sticky process and i used very small amounts of flour on my fingers and the table to make it manageable. they do look like big rings while they are shaped but as soon as you set them onto the floured towel, they contract and fatten up a bit. i did them 4 at a time so that they would fit in the pot with room to spare. they boiled up easily and i did not pay enough attention to the time on the first batch so i was sure to set the timer for the second batch. out of the water bath and onto the prepared peel for the glaze and seeds. the cornmeal did nothing to stop them from sticking; i had to lift each one and place it on my stone in the oven. they baked up an interesting ivory almost beige shade on the inside and had just a hint of onion flavor. many thanks to heather for hosting this weeks bakefest! to try this at home, visit heather’s bytes for the complete recipe or better yet, buy a copy of baking with julia. 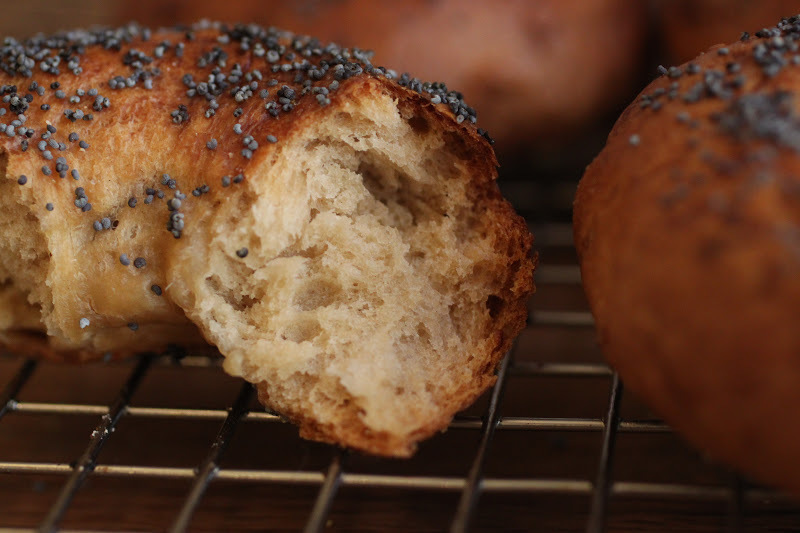 and if you want to watch the process, look it up on you tube-the video is split into 2 parts and full of hints and tips, look for it under baking with julia, bagels-lauren groveman parts 1 and 2. Your photographs do a better job at explaining the recipe than the original recipe!!! I found the recipe quite tedious too .. from all the steps to the part of throwing ice into the oven!!! 🙂 but yours have come out textbook perfect!! I liked the idea of onion but was a bit too lazy in trying to figure out how to combine it. Seems like yours turned out just great! Nice presentation. Love the addition of dried onions. Looks fabulous. 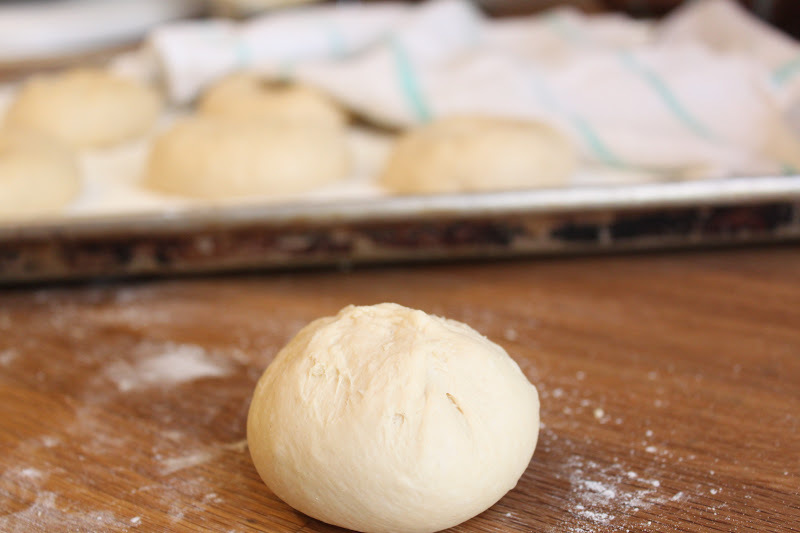 I love your little ball of dough. Lovely step by step pictures. The result is great! 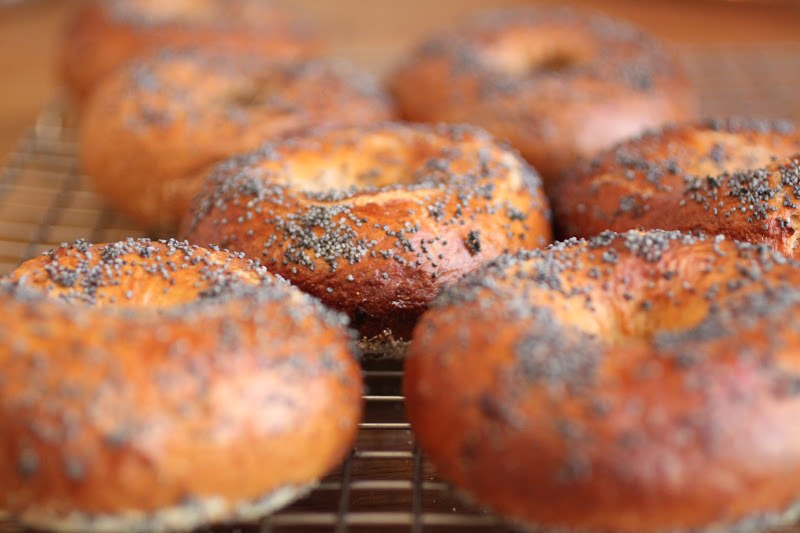 Tonight I've started this delicious „tour des blogs“ to see how the 85 bagels turned out.